For the quarterback, see Levi Brown (quarterback). Levi James Brown III (born March 16, 1984) is an American football offensive tackle who is currently a free agent in the National Football League (NFL). He was drafted by the Arizona Cardinals fifth overall in the 2007 NFL Draft. He played college football at Penn State. Brown attended Granby High School in Norfolk, Virginia and was a student and a letterman in football and basketball. In football, he was a two-year starter as both an offensive lineman and a defensive end. As a senior, he helped lead his team to an 8-2 record and was a first-team All-Tidewater selection and a Second team All-State selection on both offense and defense by the Virginia high school coaches. After his senior season, he participated in the U.S. Army All-American Bowl Game alongside future Arizona Cardinals teammate Travarous Bain. Originally listed as a defensive lineman, Brown redshirted his freshman season in 2002. In 2003, as a redshirt freshman, he started all 12 games at left tackle and played 841 snaps. In 2004, as a sophomore, Brown started 10 games, including 1 game at right tackle against Iowa, and played 630 snaps. In 2005, as a junior, he started every game at left tackle and played 869 snaps. He was named an Associated Press and Sports Illustrated second-team All-American as well as a first-team All-Big Ten selection. In 2006, he anchored a young offensive line, still earning All-American accolades. Considered one of the best offensive tackles available in the 2007 NFL Draft, Brown drew comparisons to Marcus McNeill. He was selected by the Arizona Cardinals as the fifth pick in the first round. He was the sixth offensive lineman in Penn State history to be selected in a first round of an NFL Draft, and the first since Jeff Hartings in 1996. 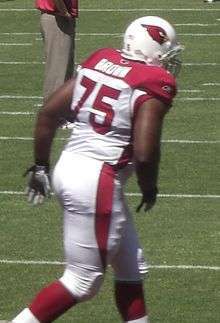 Brown agreed to terms with the Cardinals on August 2, 2007, six days after the team reported to training camp. The six-year contract could be worth up to $62 million, just over $18 million of it guaranteed. He is represented by fellow Penn-Stater Chafie Fields. On October 10, 2010, Brown scored a touchdown in a game against the New Orleans Saints after quarterback Max Hall fumbled the ball near the goal-line. He was released on March 12, 2012, but re-signed on March 15, 2012. He was placed on injured reserve with a torn triceps on August 24, 2012. In his first regular season game since returning from the triceps injury, Brown gave up 3 sacks to Robert Quinn one of which was a fumble that was recovered by Brown. Brown was traded to the Pittsburgh Steelers on October 2, 2013 for a conditional late-round draft selection. On March 5, 2014, Brown was released by the Steelers. ↑ Heitner, Darren (2015-01-26). "Amari Cooper Signs With Football Agents Joel Segal & Chafie Fields". forbes.com. Retrieved 2016-10-24. ↑ Sessler, Marc (2013-10-02). "Levi Brown traded from Arizona Cardinals to Steelers". National Football League. Retrieved 2013-10-02. ↑ Hanzus, Dan (March 5, 2014). "Pittsburgh Steelers release Larry Foote, Levi Brown". NFL.com. Retrieved 2014-07-25.